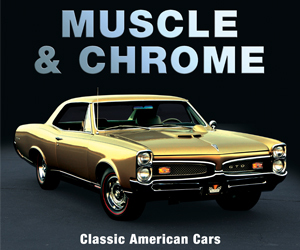 GMC has long used the tagline, “Professional Grade,” promoting the brand as being a cut above others in the same class. That has been best demonstrated in the top-line Denali trim level — recently offered on nearly all GMC models — which has been elevated to essentially a “luxury” sub-brand. It’s been particularly noteworthy in the case of the company’s Sierra full-size pickups, as the rest of the lineup didn’t really offer much over its very similar Chevrolet Silverado cousin. But that’s changing. Of course the Sierra gets its own grille – sporting, as usual, a prominent “GMC” badge – along with specific headlight treatments. But this time, much of the sheetmetal differs as well. That’s mostly noticed in the side and front-fender creases, the latter of which eschew the Silverado’s sweeping “eyebrow” for a more straight-line look that includes uniquely shaped wheelwell cutouts. The 2019 GMC Sierra (left) has decidedly different side sculpturing, headlights, and grille than its likewise redesigned corporate cousin, the 2019 Chevrolet Silverado (right). But the differences aren’t all just in front-end styling. There’s big differences in back as well … and not just due to the new “light blade” taillights. The Sierra’s exclusive MultiPro tailgate marks the truck as a GMC — beyond just what the badge says — and adds a lot of useful functionality. It’s standard on all but the lowest three (of six) trim levels. 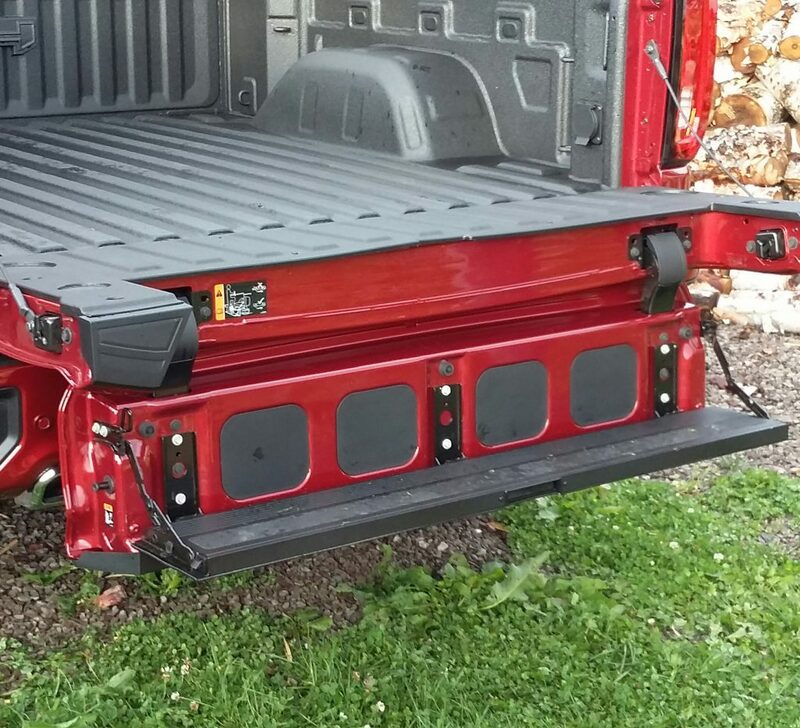 With the tailgate down, you can flip up the folding panel to form a cargo stop. With the 5’8″ bed, the “stop” is at about seven feet, but may be eight feet (for 4×8 sheets) with the upcoming 6’6″ bed. From there, you can flip down the folding panel to form a step — or, if seated on the tailgate (for “tailgating”), a foot rest. 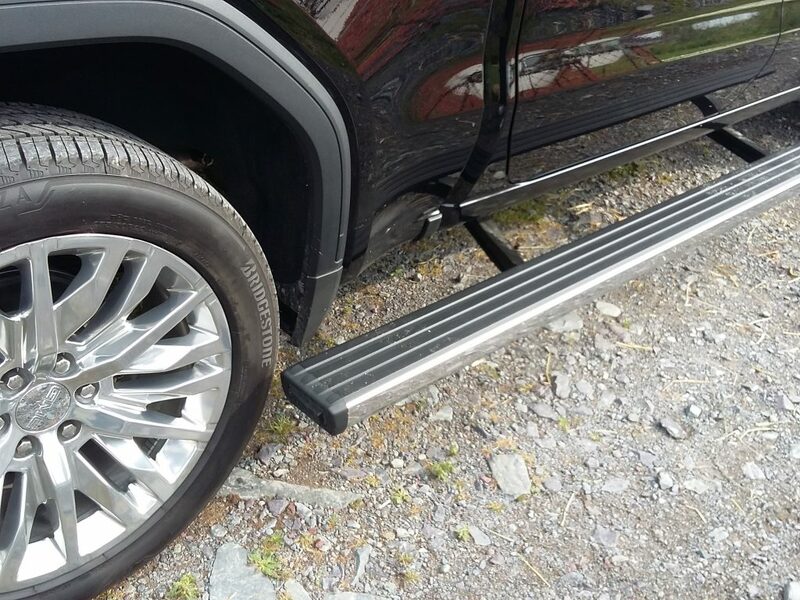 Opening the tailgate and dropping the mini gate allows you to get closer to the bed for ease of unloading. Due later is another cargo-area difference: an optional carbon-fiber box liner that GMC says will be an industry first and offer “Best in Class” resistance to dents, scratches, and corrosion. 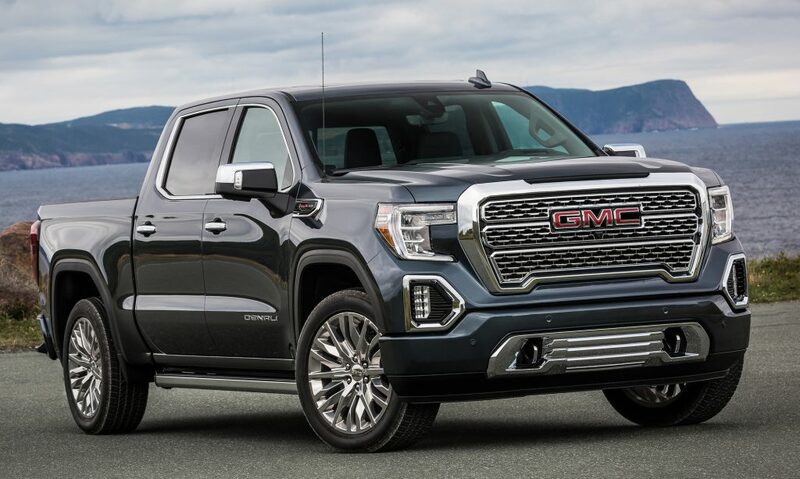 Like its Chevrolet Silverado cousin, the 2019 GMC Sierra offers a number of new features. 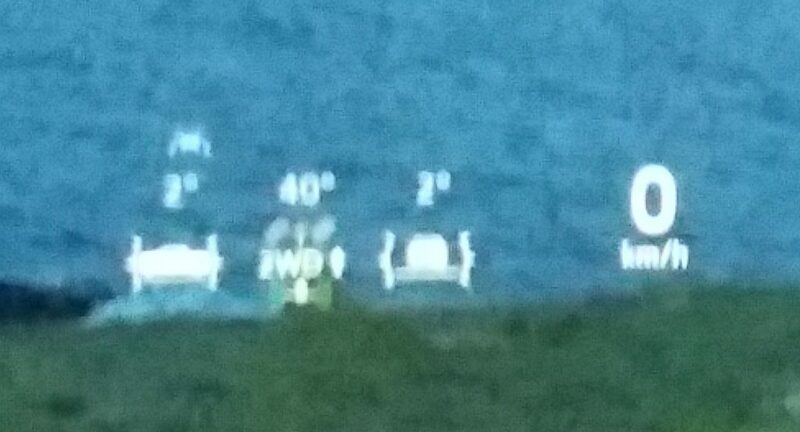 Poor focus here, but this is the image displayed at the base of the windshield by the Sierra’s available — and huge — 7-inch head-up display. Three of the most notable are a huge 7-inch head-up display, a flip-out “door” in the rear seat back that reveals a hidden storage space, and an available rear camera — mounted above the rear window — that displays its image in the inside rearview mirror (very useful if people in the rear seat or cargo in the bed block the regular view back). And for those who tow, multiple elements have been added to ease the job, including cameras that sight down the sides of the truck and look down at the hitch, a separate camera that can be attached to the back of the trailer and display its image on the dashboard screen, and in-vehicle apps (some of which can also be accessed through your smartphone) that allow you to check trailer lights, run through preparation checklists, and display trailer-tire pressures and temperatures. Newly available on the safety front are blind-spot alert, rear cross traffic alert, and pedestrian detection for the forward collision warning system with low-speed automatic braking. These join available front and rear obstacle detection, lane-departure warning, lane-keep assist, and automatic high beams. Other features offered include 360-degree cameras, dual-zone climate control with rear-seat air vents, and available Adaptive Ride Control, which adjusts suspension damping to suit the road surface. 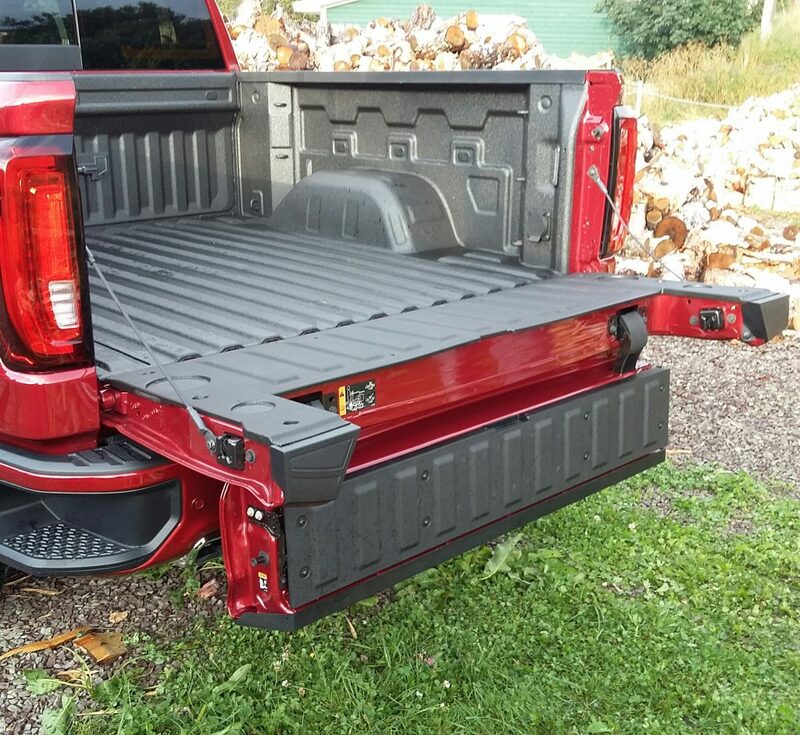 New cargo-bed features include a box that’s seven inches wider inside for greater capacity, three top-to-bottom tie-down hooks in each corner with several ports to add more, an available 400-watt 110-volt outlet, enhanced LED lighting, and a larger “step” built into the corners of the rear bumper. 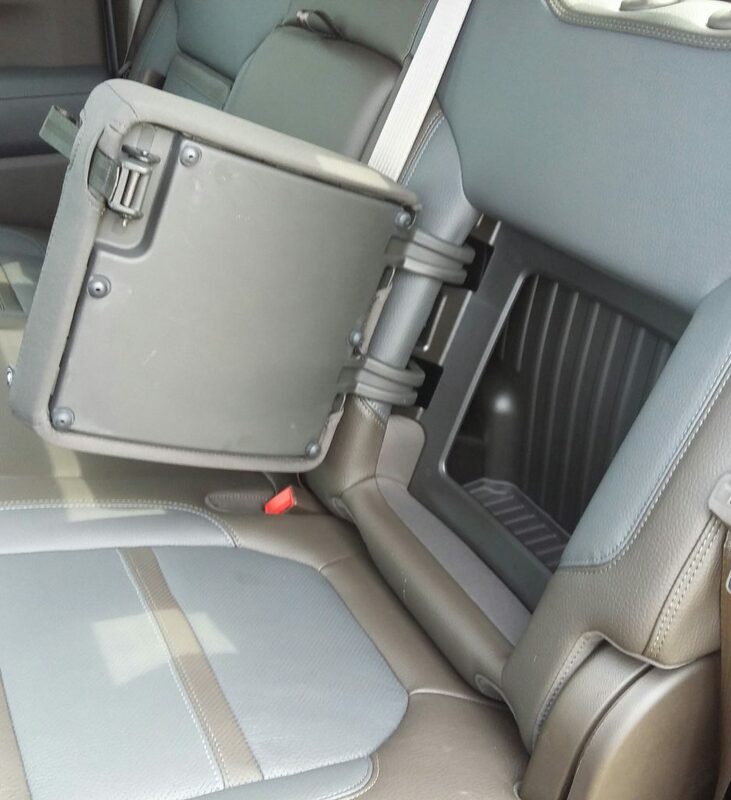 A “trap door” opens in the rear seat back to reveal a hidden storage space behind it. Also added for 2019 is a notable new trim level: the off-road-oriented AT4, which comes standard with 4-wheel drive and includes a 2-speed transfer case, 2-inch suspension lift, skid plates, all-terrain tires, off-road suspension tuning, a locking rear differential, and hill-descent control, along with distinct trim. Also helpful are head-up displays for fore/aft and left/right inclinometers and front-tire angle, along with 360-degree camera views in the dashboard screen to ward off contact with nearby objects. The 2019 trim-level “walk” starts with the base Sierra, then moves up through SLE, Elevation (with body-colored grille and bumpers, black trim, and 20-inch wheels), SLT (which brings the MultiPro tailgate), AT4, and Denali. All trim levels are due to be offered with 4WD. 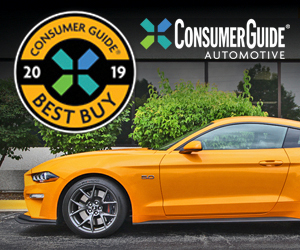 At the press preview, we only drove two V8 powertrains: a 355-horsepower 5.3-liter V8 with 8-speed automatic transmission, and a 420-horsepower 6.2-liter V8 with 10-speed automatic. Both feature cylinder deactivation and stop/start capability for improved fuel economy. EPA ratings are 17 city/23 highway with 2WD, and 15/21 with 4WD (15/19 on the AT4). Both provide ample, linear power, and the transmissions kick down fairly quickly when the throttle is stabbed at speed. Carried over will be a 4.3-liter V6, and due later (and new) are a 2.7-liter 4-cylinder turbo and a 3.0-liter inline-six turbodiesel. 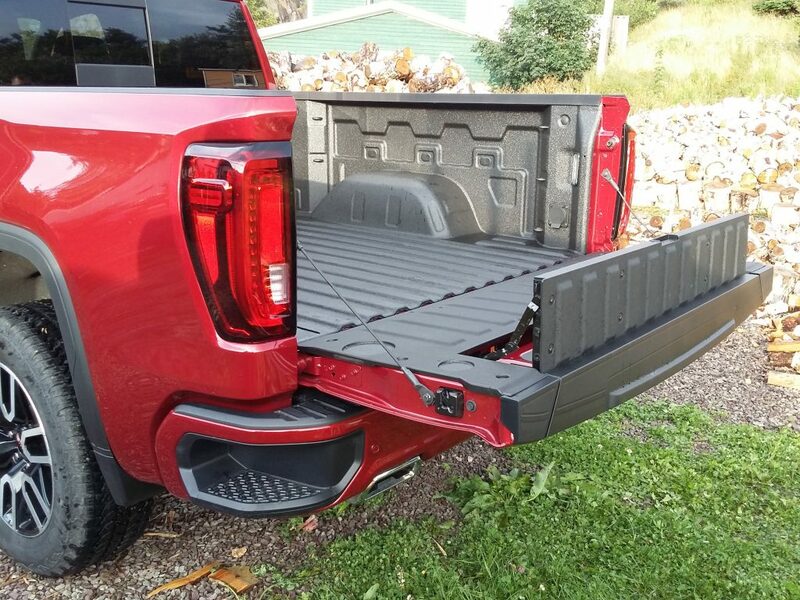 The Denali’s available power running boards can be activated by touching your foot to the back edge of the board (black rectangle), which will move them out and rearward to make a handy step for reaching into the bed — particularly nice because the bed walls are quite tall, as is the truck itself. Although we only drove crew-cab models with the 5’8″ bed at the preview, GMC says more body/bed configurations are coming. Due to be added during the model year are a regular cab with 8′ bed, a Double Cab (extended cab) with 6’6″ bed, and a crew cab with the 6’6″ bed. While we don’t know about other cabs, the crew cab grew three inches in length with the redesign, virtually all going to rear-seat legroom — which is vast. 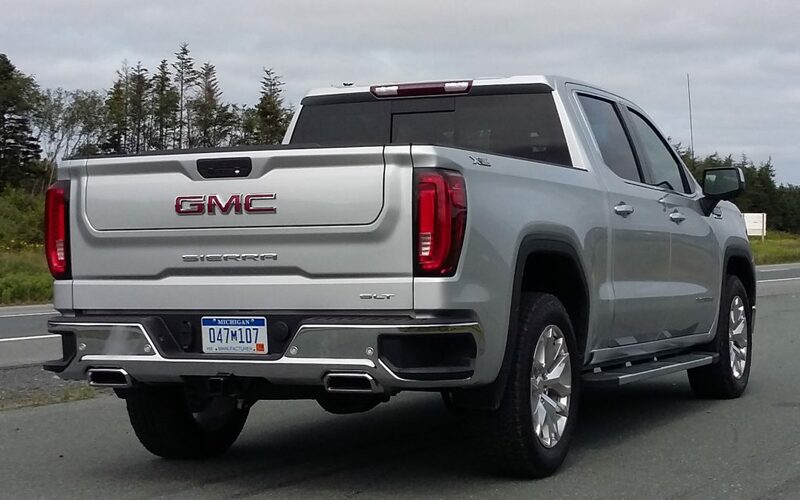 With its 2019 redesign, the GMC Sierra has really picked up its game … and sort of had to. For also new this year is the Ram 1500, and the best-selling Ford F-150 has received some updates of late. And there’s still the Nissan Titan and Toyota Tundra to contend with. Of course — if you’re a GMC dealer — the Sierra’s wildly more-popular Chevrolet Silverado cousin is another competitor, but at least you now have some features to show off that aren’t shared with that “other member” of the corporate family. What we drove at the preview were primarily top-line Denalis, which make up a substantial percentage of Sierra sales — and are most in keeping with GMC’s “Professional Grade” mantra. Written by: Rick Cotta on August 28, 2018.